People have different personalities. So do buildings. Ever walk into a party and check out the patrons? Each person has a personality. Ever walk down the street and look at the people? Ever walk down the street and look at the buildings? People usually dress wearing shoes, pants, or skirts, shirt, sweater or blouse, hat or no hat. Take a closer look at a building. Is there a base or foundation where the building touches the ground? Is there a trunk or torso or body of the building? Is there a waist or belt area? Is there a crown or hat area? Is their ornamentation? Do we dress for comfort or for show? Is the building sustainable, timely or timeless? In both fashion design and architecture, drawing, pattern-making and construction occur in relationship to the environment. Is fashion a lifestyle, a costume, a performance? Is architecture sculpture, an event or a movement? Activity 1 – Full Figure: Dress Me! In this activity you will draw, drape, pattern-make and construct 4 sample garments. Investigate the idea of skin as a relationship between the body, material and identity. Examine the relationship between the body and space. Design for four seasons: winter, spring, summer, and fall. What materials will you choose for each season? Think about weight, color, and movement of material. Think about the weather and activities. Use material swatches that you can easily find, even natural materials. Visiting a sewing center is always exciting. Once you have created some sketch ideas and collected some potential materials, attempt to mock-up your garments using a friend or a figure doll or a form. Use tape, glue, staples, pins, stitches with needles and threads…just be cautious! Illustrate your four garments. Photo document the drawing and the construction side by side. Write a paragraph announcing your garment at a fashion show. Give your collection a name and ID the individual pieces. Be sure to include appropriate accessories like shoes, jewelry, etc. Having researched and considered weather - temperature, humidity and air movement - when designing your seasonal fashion collection, take the same approach to a building. Take a picture of any building, or cut one out of the paper or a magazine. Make four or more copies of the building and label them one by one: spring, summer, winter , fall. Now using scraps left over from activity 1, dress your building. Think about how to apply materials for shade, warmth, transparency and effect. Don’t forget to consider people’s views and personal experiences inside of the building! Pleating, folding, layering, wrapping are all verbs that can cover the body as well as coat space. Take a look at the work of Issey Miyaki Fashion Designer and Brooks Scarpa Architects. Look at how bodies and buildings are covered, shielded, wrapped. Pick on of the material transformations of the architect and transform its technique in creating something to wear. Next, pick something from Miyaki or another fashion designer and translate its techniques to the scale of a building. Transfer ideas about function, form and enclosure. 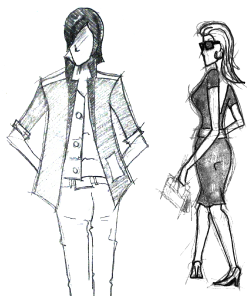 An architect can be a fashion designer! Skin is a term that can be applied to an organ of the body and the surface of a building. Both architects and fashion designers work with the human form and body. Dressing for comfort is sustainable; dressing for fashion is not. Patterns are used in both architecture and fashion. Forms are artificial human figures used for draping cloth. 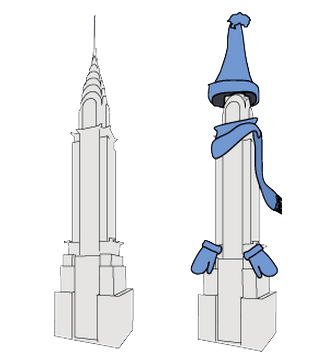 The ABCs of Architecture...so fashionable!